My parents are going to a wedding in South Carolina this weekend so I'm dog-sitting for them (for a change). I decided to bring Rascal over to our place to hang out for a bit. Emily has taken refuge somewhere and might come out by tomorrow, but Isis is non-plussed about the whole thing. I was worried that Rascal might be anxious about being in a foreign house, but he seems to have adapted well. 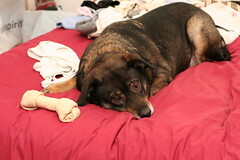 Not only is he on our bed with all my clean folded laundry, he brought a rawhide with him. Then again, I chose to get the camera versus fuss at him, so I'm not really enforcing a lot of rules around here.